Reading the news this morning and coming across “Federal Government offers newlyweds $200 voucher to attend marriage counselling” I nearly choked on my coffee, I thought when that was suggested prior to the election it was just a dodgy feel-good brain fart to make the Australian Christian Lobby & other God Squad groups feel confident about backing the Liberals. Sadly, no, looks like Kevin Andrew’s is going ahead with it. 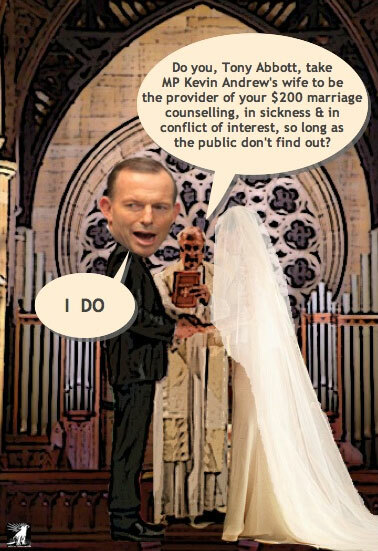 @YaThinkN A marriage prep course cost $240 through Kevin and Marg Andrews http://t.co/a1mGadmvOk Company! What did I find. Well, a 'Whois Record lookup' of MarriageEducation.com.au shows the registrant contact as "Margaret Andrews". But hey, pretty common name, may not be Social Services Minister Kevin Andrews (who is implementing this program) wife? So next step, thought I would have a look at the honourable MP’s Register of Interests, you can download the pdf 'here', though I have screenshot the relevant item in the graphic above. I could be wrong, but reckon the chances that Margaret Andrews of Marriage Education Programme Inc. is the same Margaret Andrews who is Kevin Andrew’s wife and it is just a ‘coincidence’ that Marriage Education Programme Inc. is also on this register? I won’t even get into why the hell an organisation that is charging $240 a chat for a Marriage Preparation Course can be of a charitable status? Though I suppose I should not be surprised as many social services over the past decade or so seem to have been taken over by religious organisations. Not that the website for Marriage Education Programme Inc. really screams ‘Catholic’? Anyhow, charity or not, just the fact that Mr Andrew’s is implementing a policy that his wife is directly going to benefit from has to be a conflict, in fact, he belonging to the Australian Catholic Marriage & Family Council has to be a conflict? It really is not the done thing to put in place a Government policy that directly benefits your ‘religion’ and personal area of interest in that religion? Before anyone screams at me, I was raised a Catholic, first marriage (didn't last long) was in a Catholic church so know that it is COMPULSORY to have these courses/classes before the priest will marry you. Yet, if you happen to get tossed against a wall by your husband, Catholic church is not too interested, in fact, will encourage you to try to "work it out" with your husband (yeah right...) AND should you be lucky enough to find a man who will treat you with respect, you cannot get your abusive marriage anulled? Sooo... Let's see what better uses there could be for the $20 million for this trial? School shoes for kids on the dodgy newstart payment? Shelters or Support for Victims of Domestic Violence? Give me your suggestions in the comments below, I can think of heaps! Thanks to Susan (@SElizaP) for pointing out that Mr & Mrs Andrews co-founded the Marriage Education Programme in 1980 so obviously a long held belief in Marriage Counselling. Lovely that Mr Andrews can now use his position as the Social Services Minister to ensure these groups like the Australian Catholic Marriage and Family Council can carry on with this $200 Wedding Voucher to be used for 'Counselling'? The Hon Kevin Andrews MP - some useful background info http://tasmaniantimes.com/images/uploads/Andrews.pdf … he & his wife on board of...http://www.fightpp.org/ which is a bit of a worry? Another blast from the past courtesy of Dr Sally Cockburn (@DrSallyCockburn) "Andrews in radical group that boycotts Disney" Ladies & Gents, this is your Minister for Social Services? 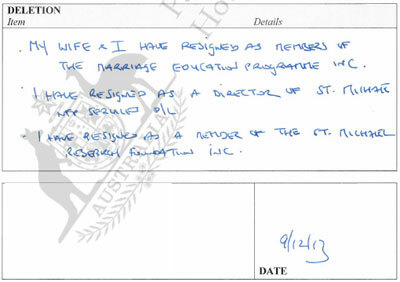 Mr & Mrs Andrews may have resigned from Marriage Education Programme Inc. on the 9th of December 2013 (see above), though it seems this 'organisation' is still happy to promote the purchase of Mr Andrews book “Maybe 'I Do': Modern Marriage and the Pursuit of Happiness”? 23 Jan 2013 "#CashVows - Newlyweds $200 Marriage Counselling Voucher" Written by David Marler - Fairfax journalist Jonathan Swan reports there is no conflict of interest as Margaret Andrews has quit her job. Noely: "That would obviously be correct that there is no direct conflict as Mrs Andrew's has quit her job (as we saw on the register of interests above) though this may not be a direct monetary benefit it still 'smells'. I am sure if the wider public were aware of exactly how this policy was pushing a particular barrow of Mr & Mrs Andrews that they have held for decades & advocated for strongly, not to mention I am sure they get support from these Catholic communities, I am not so sure it would fly as legit, it would look more like using public funds to to prop up a niche 'Ideological' stance a politician has." Thank you Helen Davidson "My marriage doesn't need government help. Give $200 to someone who does" - this is a seriously good piece in the guardian, please read. Thank you to Jason Tin (@jasonthetin) of the Courier Mail for raising this issue in the media "Kevin Andrews has no problem with government marriage counselling handouts because his wife is `no longer a marriage educator'"
26 Jan 2014 Update: Let's ramp up the offensive... Mrs Margaret Andrews has received an OAM (Medal of the Order of Australia) for "For service to the Catholic Church in Australia through a range of marriage education programs." make of that what you will?